At the start of World War I the German infantryman wore a more practical uniform than those in many other armies. Nonetheless it still recalled the past glories of the Franco-Prussian war. As the war progressed functionality and economy came to be all important, and the soldier's look changed considerably. However the figures in this set are of the early period, when there was still some style in the clothing. As with all the Airfix Great War sets, there are a good many poses here which allow a lot of flexibility. We particularly liked the grenade thrower as he is much better animated than many such figures in other sets and really looks to be putting effort into the throw. The many riflemen are joined by a man using a flame-thrower, which was first used by the Germans as early as 1914, and by a prone figure with a pole-charge ('Bangalore Torpedo'), useful against fixed positions and wire. 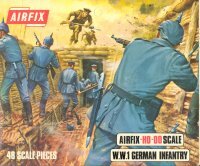 Airfix acknowledge the terrible human price paid in the war with both a casualty on the ground and another being evacuated by stretcher. Finally there is a group surrounding a machine gun. The men wear the tunic that saw service during the first two years of the war. This was the M1907/10, although it saw several changes (simplifications) as the war developed. None of those on these figures has any cuffs, which is incorrect as several styles were used, yet they have the decoration on the rear skirts. The other major change in uniform in 1916 was the introduction of the Stahlhelm, the instantly recognisable German helmet that replaced the Pickelhaube which is worn here. All the men wear the spike, but this was often removed when in the front line, so some may wish to trim this item off. The Pickelhaubes all seem to have the cloth cover (that obscured the badge), which was the norm in battle. Apart from the missing cuffs and some apparently missing pocket flaps the uniform is properly done but with a strange affair at the lower rear of the tunic where the piped false vertical pockets should be rather than the triangular affair that is modelled here. Webbing and equipment too has plenty of problems, partly because most of the men are missing some or all of the items they would normally carry (even in assault order they would carry more than this). Many have nothing at all except their cartridge pouches, which is not realistic. The pouches themselves are also a problem, as they should be the M1909 set with two pouches divided into a total of six parts, or possibly the older undivided versions that were sometimes issued when supplies of the regulation design failed. What we have here are mostly very small pouches which look like those issued to pioneer or reserve units, or to the cavalry, so it is wrong to imply these were so common as to be issued to everyone in this set. Another problem is many figures have support straps over the shoulders that meet at the back in either an 'X' or 'Y' arrangement. This is quite wrong as such straps attached directly to the pack, which most here are missing. On the other hand we liked the fact that several men wear the classic peakless M1907 cap, which was sometimes worn in action as the Pickelhaube offered no more protection. Whilst we applaud the inclusion of a flame-thrower, we were not too keen on the way it was done. Most flame-throwers at this stage of the war were operated by two men, with one carrying the tank and another holding the hose. The one man device shown here, which is greatly simplified in any case, is not really appropriate for troops in this uniform. The machine gun is also simplified, and does not resemble any German machine gun of the time but must be the classic MG08. This was normally on its own unique carriage, but Airfix have placed it on a tripod, which was not unknown but quite rare and a poor choice for this set in our view. Like everyone else the Germans made good use of captured weapons, but this weapon does not look much like any Allied weapon either. The three crew around it are not actually using the gun (and also lack the drag straps usually seen). One is holding up an ammunition belt and the other two are touching the gun, but none are looking where the gun is firing, and the ammunition belt is nowhere near the gun. The illustration of the piece on the back of the older Airfix boxes shows a much better arrangement, but the holes in the base force the group to look like the picture above. The Airfix catalogue confirms this arrangement, which makes for a much less effective group than could have been the case, and some may like to make new holes and rearrange the figures, though other manufacturers have modelled the same thing very much better. These are very nicely sculpted figures, with clear detail and plenty of action. There was some flash to be removed, but this was not too bad considering the age of the set (although this can vary). The inclusion of the machine gun, the stretcher party and the surrendering figure help to make a good range of poses, and the figures wearing the cap rather than the helmet allow many conversion possibilities. However the missing equipment and accuracy problems mar a set that is not without its charm and continues to be fondly remembered by many older modellers today.